Ampcare utilizes Neuromuscular Electrical Stimulation (NMES) to create a more effective and effortful swallowing exercise for your patient. Learn what you can accomplish in only 30 minutes of treatment with our ESP. 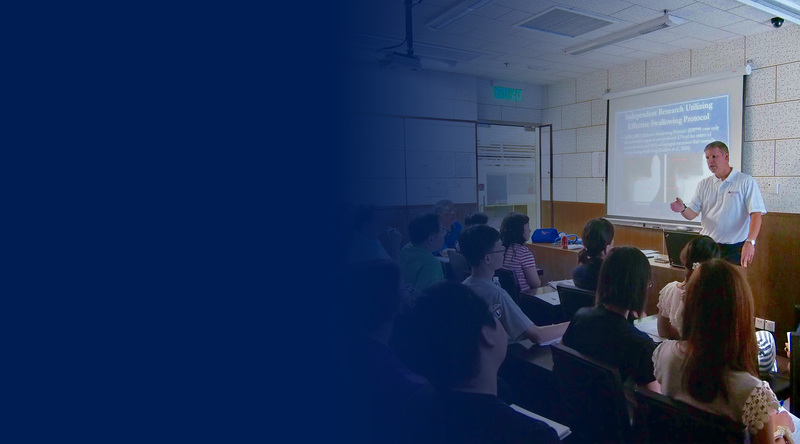 Specialized training provides 8 hours of ASHA continuing education. Member products are to be used only by trained licensed therapists under prescription of a physician. Ampcare develops therapeutic neuromuscular electrical stimulation technologies and is proud to offer the FDA-cleared Ampcare Effective Swallowing Protocol (ESP™). Ampcare’s ESP provides clinicians a new alternative for treating patients who suffer from swallowing difficulties, also known as dysphagia. We are committed to delivering positive patient outcomes and innovative products specially designed to meet the needs of both the patient and medical professional. Our vision is to eliminate pneumonia and the use of feeding tubes resulting from swallowing problems by improving the options and availability of dysphagia treatment techniques. 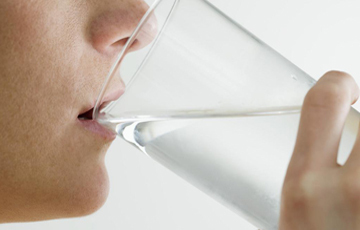 Dysphagia is the medical term for the symptom of difficulty in swallowing. It is derived from the Greek “dys” meaning bad or disordered, and “phago” meaning “eat”. Dysphagia affects 18 million people in the US and 45%-87% of residents in long-term care. One out of 17 people will eventually develop dysphagia. Pneumonia, largely arising from swallowing problems, is a leading cause of death in Americans over 65 years of age. 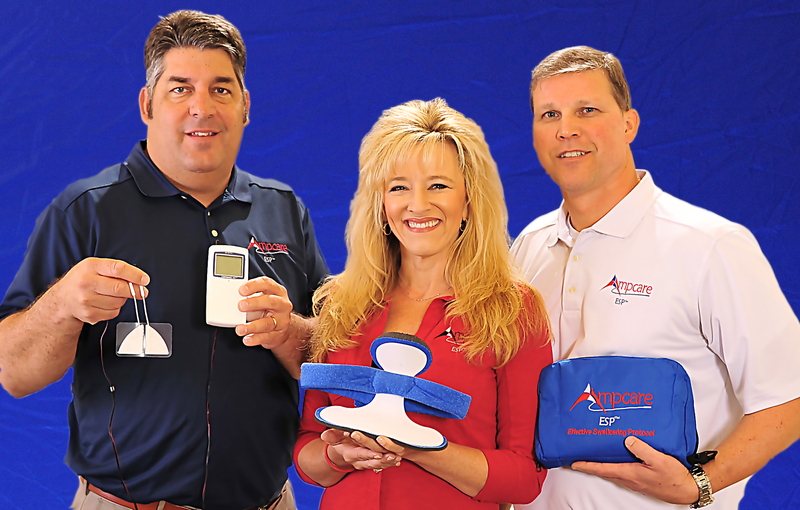 Rick, Ronda and Russ have worked together for over 23 years to establish new treatment protocols in oropharyngeal dysphagia, using electrical stimulation as a modality for speech language pathologists and to improve treatment outcomes for patients. Through their interdisciplinary care approach and synergy of ideas, they have become co-owners of Ampcare and are working to bring cutting-edge modalities to the dysphagia therapist. The first of these is the ESP or Effective Swallowing Protocol. ESP is a treatment for dysphagia that combines the most effective electrical stimulation parameters with resistive exercises. We have received our FDA clearance to market the Effective Swallowing Protocol (ESP). 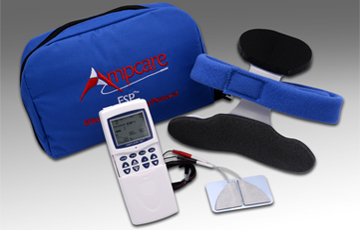 This includes a portable powered muscle stimulator with easily adjustable parameters and the Ampcare E Series electrodes to elicit the most comfortable motor contraction for the patient. Research demonstrates that our recommended treatment time of 30 minutes makes our technology and exercise protocol paired with the Restorative Posture Device (RPD) both effective and efficient. "I can honestly say this is the only course that I have ever attended where I did not want to leave the room because I would miss some great info. This course was fantastic and every slide/topic was incredibly pertinent. Never a dull moment, and the material is incredibly practical to my clinical practice. Thank you!" "Excellent course! Loved the application & knowledge gained to exercise physiology! Really makes everything come together!" "The Ampcare Team made learning fun, and has been accessible for any questions! Great new tool!" Ampcare develops therapeutic neuromuscular electrical stimulation technologies and is proud to offer the FDA-cleared Ampcare Effective Swallowing Protocol (ESP™). Ampcare’s ESP provides clinicians a new option for the treatment of dysphagia (swallowing difficulties).